A series of interviews with retail employees conducted by a labor movement website paints a scathing picture of what it’s like to work at the Apple Store: underpaid, demoralized, physically drained and with no way to secure full-time benefits without turning your personal life over to Apple. Here’s the breakdown of the complaints. • Veteran Apple Store workers asking about pay disparities (namely, that new hires were being paid more than many employees who had been at the Apple Store for a year or more) are told that “money shouldn’t be an issue when you’re employed at Apple.” Rather, the chance to work at Apple “should be looked at as an experience” worth more than competitive pay alone. • Apple Store keeps its retail employee healthcare costs low by defining all employees as part time unless they can literally guarantee that they will be available to work at anytime the store is open. This is true even if you work 40 hours a week. The piece by In These Times is worth a read, even if it’s a pro-union site with a very clearly stated agenda. So take this with a grain of salt. 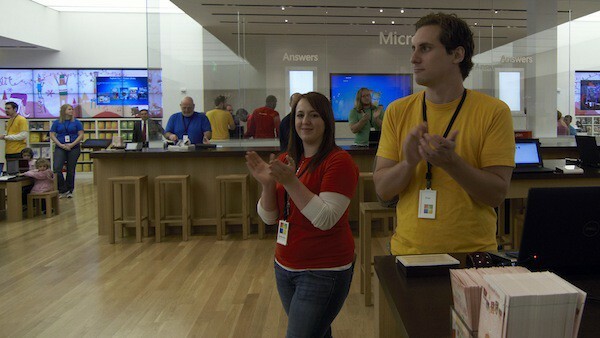 If this is really the way that Apple is treating its retail employees, though, no wonder they want to unionize.